We are a manufacturer of stock and customade items. Businesses, schools, organizations and individuals nationwide depend on Arista Flag Corporation for advertising and identification banners and flags. Established in 1973, we are located in the Husdon Valley of New York State and are dedicated to providing quality products at prices that are exceptionally competitive. Our flags and banners are eye-catching, colorful and well crafted. 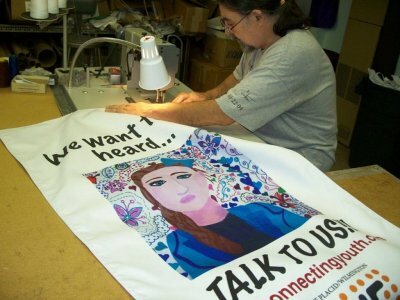 We use state-of-the-art, banner making systems and techniques, with the best fabrics and materials, to create high-impact, cost effective results. No wonder that we have so many repeat customers. We care about our customers and their needs. When we first started making flags and banners, we began by using the traditional sew and applique technique. Then over the years, as technology changed, we became proficient in the newer more dynamic techniques such as dye-sublimation printing and large format inkjet printing. With time and experience, we delevoped the reputation as an industry leader and innovator. Our products are now produced using a range of techniques and methods including the sew and applique method, the dye-sublimation method, traditional screen-printing and direct large format inkjet printing. What's important to you, the client, is that regardless of method, we are truly all about providing quality and value, and that mind-set is obvious in all our work. We take great pride and satisfaction in producing and distributing the products that help our customers achieve their goals - Ask us to quote on your specific project requirement. Final thoughts about equipment and our confidence as flagmakers: Making flags and banners was once an experience limited to using a needle and thread and scissors. The flagmaker would use dye, paint and fabric. Today, however, we use large format industrial printers and cutters manufactured by Mutoh and Epson, computers, and versatile industrial sewing machines. This equipment, especially the top-of-the-line printers, insure that our customers receive the finest quality products in appearance and durability. The combination of our skilled staff, quality fabrics and materials, and wonderfully adaptive equipment results in achieving your design and layout ideas quickly and cost effectively. We are very confident that we can satisfy your requirement so that you can convey your image and presentation with pride.